The winner of The Story Prize for short story collections published in 2012 is Claire Vaye Watkins for Battleborn (Riverhead Books). Watkins takes home a check for $20,000 and an engraved silver bowl. The runners-up, Dan Chaon and Junot Díaz, each take home $5,000. All three deserve a big round of applause: They wrote great books that made our judges' decisions difficult. Battleborn is a collection of 10 stories set in the American West. Settings range from the California Gold Rush of 1849 to the founding of Reno in 1859 to the abandoned movie set that housed the notorious Manson family in the late 1960s to recent times haunted by these past events. The collection’s title refers to the state motto of Nevada, the author’s home state, where many of the stories take place. 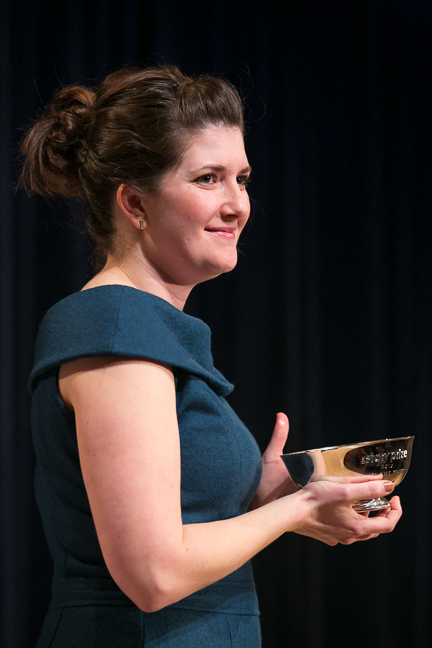 Claire Vaye Watkins is the ninth ever winner of The Story Prize and first woman to win since Mary Gordon for The Stories of Mary Gordon in 2007—the third year of the award. Edwidge Danticat’s The Dew Breaker was the first ever winner in 2005. Watkins is also the third debut author to win. The other two were Patrick O'Keeffe for The Hill Road in 2006 and Daniyal Mueenuddin for In Other Rooms, Other Wonders in 2010. In the days ahead, here and on our Web site, we'll post citations from the judges, photos from the event and the after party, and links to media coverage.